S.T.Dupont Intense Pour Femme and S.T.Dupont Intense Pour Homme make a new luxurious duo by the house of S.T.Dupont which continues tradition and shows the art which has been inherent to this house for years. Aromas of the new fragrance nurture the style of previous compositions created in ultimately elegant way. 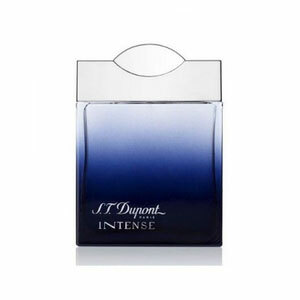 Masculine edition of Intense duo, S.T.Dupont Intense Pour Homme, is constructed as a woody-oriental fragrance created in cooperation with perfumer Christophe Raynaud. The fragrance is balancing between passionate, temperamental rhythm and absolute elegance. Top notes will cheer you up with lemon, bergamot and lavender, which leave aromatic and luminous effect in the very beginning. Connection with a heart of the fragrance is created by spicy touch of saffron combined with orange blossom. Base notes introduce a passionate, masculine layer of tonka, styrax, cedar, musk and amber, along with clear leather accords. Its flacon is also coloured in dark blue and crowned with a silver stopper. S.T.Dupont Intese Pour Homme was launched in 2009.